A brilliant tablet that has further raised the bar for the rest of the competition. If you're in two minds what to go for - this is your choice. Update: The iPad Air 2, while now discontinued, remains a viable option because it's a cheap, yet powerful enough Apple tablet. It runs the latest version of iOS 12, and although Apple wants everyone to buy the iPad 9.7, this is still one that we can recommend in 2018. However the company has announced a new iPad Air, with a 10.5-inch retina display and new Bionic 12 chipset for faster processing power. 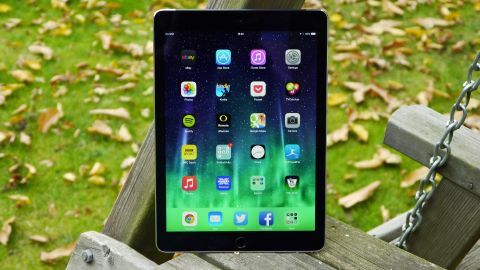 The Air 2 may still be available to buy from vendors but the new iPad Air is an improvement in many ways, so check it out before you decide which tablet to buy. It was hard to see how Apple could improve on the first iPad Air - arguably the finest tablet ever produced at the time. And then it went and did so with the iPad Air 2. You can talk all you like about what counts as "too thin" but there's no denying that this tablet is a feat of engineering that for the time pushed the limits of what makes a premium slate. Plus, unlike the iPhone 6 Plus it doesn't bend either! Not only that, but the relentless desire to make the thing thinner has resulted in a better screen too, as the layers that make up the backlight, touchscreen digitizer and LCD screen are so close that Apple now claims there is zero air in between them. The result? A less reflective display that looks brighter and more colorful. And it really is. Since its arrival though, Apple has launched a new fleet of slates, with the iPad Pro 11 and iPad Pro 12.9 (2018) taking up position at the top of the firm's tablet offering and the iPad 9.7 launching as budget option. So, in the face of that competition - and the other slates that have launched since the Air 2 - is the iPad Air 2 still worth buying? The launch of Apple's new Pro slates and iPad 9.7 have resulted in the lowering of the iPad Air 2 price which now starts at around $399 (£379, AU$569) - originally $499 (£399, AU$699) - for the 32GB, Wi-Fi only model. That's not as much of a drop as you might expect but then this is still a very capable tablet. You can't buy the iPad Air 2 directly from Apple anymore, but you can find it at other retailers around the world and if you take your time to search around you'll likely find it even cheaper than the prices above. That said, it's becoming increasingly hard to find it new - and that rarity may be contributing to the still quite high price - so if you want it you should snap it up fast. Of course, with the much newer iPad 9.7 starting at $329 (£319, AU$469), the iPad Air 2 isn't quite as compelling at it once was. That said, if you're happy to get a pre-owned or 'refurbished' Air 2, the price drops significantly - we've seen it for under $250/£250. At 6.1mm thick, the Apple iPad Air 2 is still one of the slimmest tablets on the market. It's not actually the thinnest, but we're at the point now where fractions of a millimetre really don't matter. Thinness for its own sake can be an error - there is a point of diminishing returns where only marginal improvements can be achieved, at the cost of structural integrity, battery life and overall performance - but Apple hasn't reached that point yet. The iPad Air 2 feels like a very solid tablet that can be held easily for hours without it getting uncomfortable. The iPad Air 2 is hardly a big tablet, but the Samsung Galaxy Tab S2 is both smaller and lighter with the same size display. Where the Apple device wins though is the overall packaging. Samsung's option is good, but clearly an assemblage of distinct parts. The plastic back, the larger-bezelled screen and the rim are all competing parts, where the iPad Air 2 is a complete package, smooth and easy to hold in one hand. I was almost loath to put it in a case - it needs to be protected if you're going to be running it around town, as that back and chamfered edges will scuff up eventually - but if you're going to be a sofa-warrior with your new tablet, the Smart Cover will do just fine and won't obscure the impressive design. The sad thing here is the loss of the silencing switch, which has departed due to size restrictions. Apple would argue that this is because the new Control Center makes the option available throughout the OS with just a flick of the hand, but in truth I'm really going to miss being able to silence the tablet without even looking. The power button remains at the top and the volume keys have shuffled a little upwards now free of the silence key, but otherwise the only real design changes are the speaker grill at the bottom of the tablet (now a single row of holes, rather than the two before) and the Touch ID on the home key. You'd be hard pressed to tell the difference between the iPad Air 2 and the iPad Air without a spotter's guide, but the iPad Air 2 has a deeper black bezel which helps enhance the picture - plus it now comes in gold to join space gray and silver. The camera stays where it has been, both front and back, with the new 8MP iSight snapper not jutting out as it does on the iPhone 6 and 6 Plus. The fact no tablet camera needs to be that high res, nor should people be taking pics with a tablet anyway, is something to discuss in another article. Does the iPad Air 2's design warrant the high price tag? Yes, more than any other tablet on the market. It brings a premium build, quality finish, great looks and while it doesn't need to be this thin, the structure doesn't seem to have had an effect on the actual performance of the tablet, and does add something in the palm.